On Friday afternoon the long-awaited report from special counsel Robert Mueller on Donald Trump’s collusion with Russia to steal the 2016 presidential election was released to Attorney General William Barr. Early reporting suggests that there are no further indictments expected, at least from the Office of the Special Counsel. That doesn’t mean that there aren’t potential crimes that Trump can still be charged with by a U.S. Attorney, a state prosecutor, or Congress. Only that Mueller has chosen not to pursue them himself. And that may just reflect Mueller’s strict adherence to Justice Department guidance that a sitting president may not be indicted. Even though that’s not a law and isn’t legally binding. Almost simultaneous to the report’s release, right wingers and Trump supporters began their woefully premature celebration, believing naively that the whole affair was over. In fact there are at least seventeen other active investigations in progress. But chief among the plaintive cries of Trump’s adoring cultists is a bizarre demand for an apology from – well, they don’t really say. Presumably Mueller, or the Democrats, or the media, or the Guardians of the Secret Society of the Deep State. But of course, investigators who successfully filed hundreds of valid charges, resulting in thirty-seven indictments, and obtained seven convictions of high profile Trump associates, don’t owe anyone an apology. Most of those convictions came from guilty pleas by Trump’s inner circle comrades like his National Security Advisor Michael Flynn, his campaign chairman Paul Manafort, and his personal attorney Michael Cohen. But that hasn’t stopped the flurry of furious apology seekers. It began shortly after the news that Mueller had given his report to AG Barr. The first question asked of Sen. Chuck Schumer was if Trump is owed an apology. Schumer replied that “we should wait for the full report to be made public.” Kimberley Strassel of the Wall Street Journal wondered “when Americans can expect an apology from all those who spent two years getting it breathlessly, abjectly and irresponsibly wrong.” Which is an assessment that is completely removed from reality. The Washington Times seemed troubled that “Adam Schiff makes no apologies for investigating Trump.” Which might be because his investigations are still proceeding. 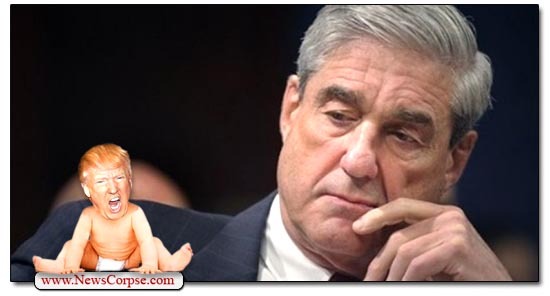 In a segment with Lou Dobbs of Fox News, Tom Fitton of the ultra-rightist Judicial Watch was elated that “the long national nightmare is over.” He opined that the Mueller report should include an apology to Trump. There were even a couple of loopy twidiots who proffered that it’s Russia who is owed an apology. There were thirty-eight tweets referencing the allegedly “angry Democrats” who Trump believed were engaged in “presidential harassment” (aka accountability). He connected Hillary Clinton to the probe twenty times. Trump alleged that Mueller was “conflicted” sixteen times. And that his probe was “illegal” ten times. James Comey’s role was mentioned eleven times. The infamous Steele dossier got nine citations. Robert Mueller, is a life-long Republican and a true American hero. He was a Marine enlistee who served with distinction in Vietnam. He was awarded the Bronze Star, Purple Heart, two Navy Commendation Medals and the Vietnamese Cross of Gallantry. All the while Trump was struggling to obtain five draft deferments and suffering from alleged “bone spurs” that no doctor has confirmed. Mueller then spent the majority of the rest of his career in public service and law enforcement as an attorney in the Department of Justice and Director of the FBI. That’s the man that Trump slandered as a conflicted, illegal, disgraceful, witch hunter. And now that Mueller has delivered a report that doesn’t exhibit any signs of being “rigged” or tainted by bias of any kind, shouldn’t Trump apologize to him for two years of smears and character assassination, all fabricated to cover up his own criminality? Will Trump express any regret or ask for forgiveness. Well, he never apologized for his racist lies about President Obama’s birth, or his insults to Sen. John McCain for having been captured in Vietnam, or for assaulting at least sixteen women, or for failing to condemn neo-Nazis. So it would not be advisable to hold one’s breath in anticipation of an apology for this. Trump just doesn’t have the character or morality to ever do the right thing.